Hey pals, I’m on my way of posting a new blog post today. Last time, I brought you to Dumaguete’s Boulevard and the beautiful residential resort Tierra Alta. So, what’s next? Do you have any idea? Come on! 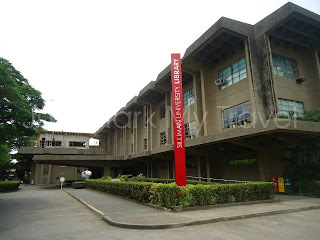 I won’t end my journey in Dumaguete without paying a visit to Silliman University. According to university’s official website http://su.edu.ph/, Silliman University is the oldest American institution in Dumaguete City, Negros Oriental. Seeing it in live is already an achievement so the United Backpackers didn’t miss the chance. We tour around the whole vicinity of one of the famous school in the Philippines. It is so good that we had the chance to drop by at their library building. Most probably, their top students or wiz students usually hang out there. Since, we aren’t really up to hanging out with their wiz students. We moved to their freedom wall. We checked out their messages on it and pose also with the freedom wall as our background. Well, we’ve got freedom! 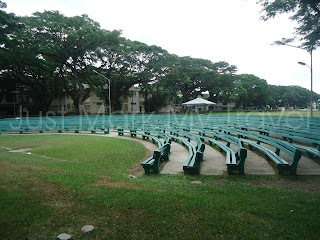 We’ve seen also their ground with curve-shape chairs.It reminds me of a small movie theatre. It’s really unique and beautiful. Honestly, I don’t know how they call it. So, if you know let me know. In fact, Dumaguete is not just known as the capital of Negros Oriental but also known for the refined, clever ambience represented by its most famous institution, Silliman University. Now, if you’re interested to visit the place make sure also to witness their amazing marine world. Dumaguete is also a gateway to nearby dive sites at Apo, Sumilon and Siquijor islands. That means non-stop fun all the way! that's a great place to stay.... just mark it! Mostly people did not get this type of places that you have got you are lucky for your thinking like this type of place you can live know your dream come true and you got a great place. Unlike in years past where teachers taught and students did homework at home, now there is an opportunity to reach out to your students in a fun and educational mode outside the classroom. Connecting with your students in an educational way that solidifies what they learn at school with the latest technology is one of the best innovative tools teachers have today.